GREAT GOLF, TENNIS AND POOL CONDO NEWLY FURNISHED. 20 MINS TO PALM SPRINGS !!!! Have fun at the pool very close to condo, This one bedroom condo will sleep four with a pull out queen bed in the living room. After a long day wind down by relaxing with high speed Wi-Fi along with Netflix, Hulu, and Amazon Prime Video on two HD Smart TV's, one 55" in living room and the other 50" in bedroom. A fully equipped kitchen with large refrigerator, stove, dishwasher, and microwave along with all the utensils you will need pots, pans etc. along with toaster, coffee maker, and blender. There is a ceiling fan in the kitchen as well as whole house A/C and heat. 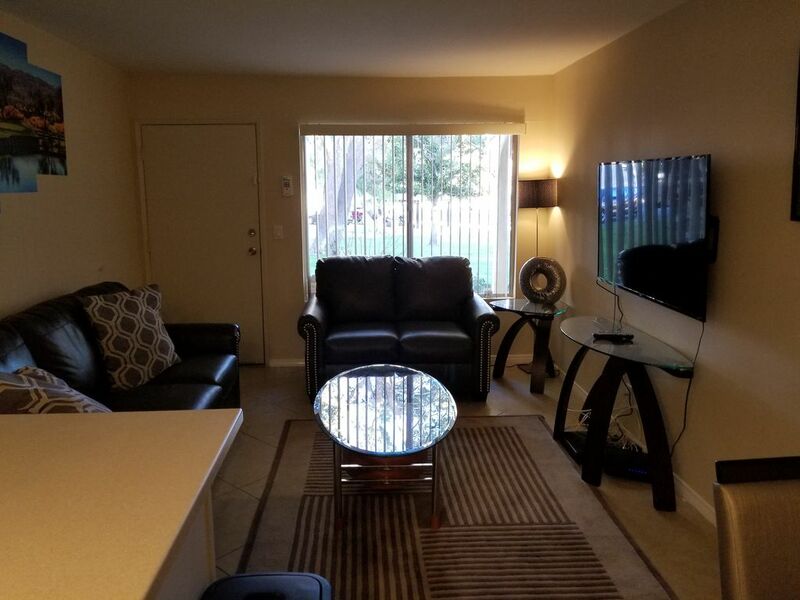 This unit is just a short 20 minute drive to Palm Springs, Palm Springs Aerial Tramway and Morongo Casino. Several other casinos and sights are just a few more minutes away. Temperatures from November to March average high’s in the 70’s and low’s in the high 40’s and low 50’s great for sightseeing and enjoying the area. 24/7 Home Security Alarm System. All you need to do is bring your suitcase and have fun!!! Why pay for a hotel when you can have much more for much less. Also this is a NO SMOKING UNIT. I wanted a property in this area for all the golfing and relaxation it provides. Big city feel without the bustle and hustle. Also plenty of activites very close by, golfing, skiing, very good casinos and Cabazon Outlets with many shops. We really enjoyed our stay in this condo. The condo is small but for two people it was perfect. The condo is equipped with anything you might need. Furnishings are very nice. We had a bit of an issue with how clean it was when we got there but once we did a little of our own cleaning it was fine. The kitchen area is really nice and new also. New sink, cupboards, countertops, all very nice. The grounds are beautiful. I loved the grassed area out front that also has a barbque area that anyone could use. The heated pool was really nice and kept so clean. I would recommend this condo as a very nice stay. We enjoyed our stay at the condo in Desert Hot Springs very much. It's a very quite place and a short distance to Palm Springs. The hot tub was wonderful as well.